All the Toys for all the Yachts! Tenders, Toys, Swim, Dive, Work and More! Get high quality floats when you buy NautiBuoy floating platforms. NautiBuoy are designed for rugged and long lasting yacht use. Contact Us and we can answer your price and model questions. Brownie's Yacht Toys offers quality water toys as well as land and air toys from three locations in Fort Lauderdale and Palm Beach, Florida. Find the latest in yacht toys including dive gear, dive scooters, drones (water and air), Brownie's Third Lung and more. Yacht Floating Platformsfor water toys, tenders, swimming and maintenance. 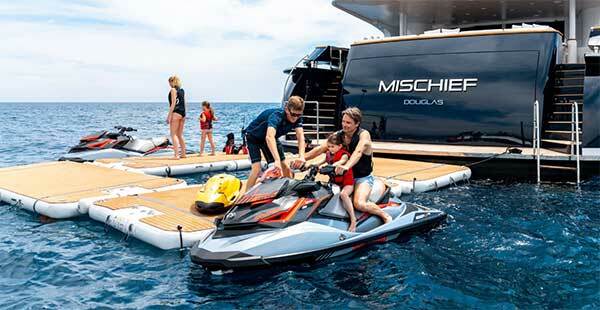 See the latest in news for Yamaha Seascooters on our Yacht Toys News page. Please use the contact info below. We look forward to hearing from you soon.